DAVID & CHARLES BOOKS-Jelly Rolls are the new fat quarter bundle! They consist of 1.5 inch strips of color coordinated fabric rolled up to create a solid disk and tied with a ribbon. "Jelly Roll Quilts" is the first book to show quilters the best ways to use these desirable and labor-saving fabric packs. Learn how to make 16 quilts perfectly suited to the color coordinated rolls as well as a variation in color way style or size for each project. 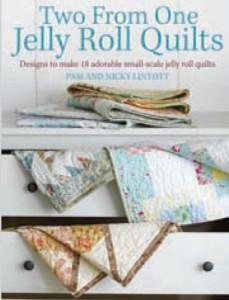 Jelly roll quilts are suitable for quilters of all abilities especially those with a passion for fabrics. From Bars of Gold and Blue Lagoon to Pineapple Surprise and Starlight Express the quilts in this book are at the cutting edge of the craft! By Pam and Nicky Lintott. Softcover: 128 pages.